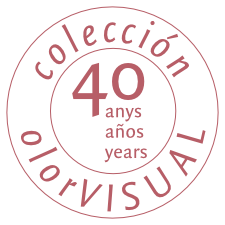 The exhibition Olor de Cerdanyola (Smell of Cerdanyola), which has been created especially for the Museu d´Art de Cerdanyola, seeks to engender a new understanding of both the history of the territory and the character of the place by means of works of contemporary art from the colección olorVISUAL. Places and events in Cerdanyola´s history have been interpreted through the nose and ´read´ in terms of four of the olfactory notes that make up what the creators of essences refer to as the “alphabet”. These four olfactory notes are matched with colours that represent them, and smell and colour together thus give rise to the four areas in which the exhibition is articulated. Coniferous, in representation of the Collserola hills in which the town is located. The notes of pine, cypress and turpentine that form this olfactory chord transport us to the natural park. Floral: geraniums, roses and hyacinths evoke the era of Modernisme and the Barcelona bourgeoisie who spent the summers here, exchanging the heat and dust of the city for the area’s delicious air and a cooler climate. Chemical-metallic for industry and the construction boom of the nineteen sixties. Scents of medicines, laboratories, iron, aluminium and steel summon up that period of industrial expansion. Powdery: volatile but resonant chords such as talc, plaster or vanilla relate to the university, research and knowledge, which became much more present in Cerdanyola with the opening of the Autonomous University of Barcelona.